Does Eating Raspberry Really Lead To Weight Loss? Are you on a serious weight loss spree? Have you ever tried raspberry for it? Yes, the sweet and sour extract of this tiny exquisite berry has been proved to be a miracle remedy for weight loss. It belongs to the rose family and is native to Europe. But amazing health benefits, especially the potential fat burning capacity, has made the fruit popular across the world. Prior to digging into the weight loss benefits of raspberry, let us have a look at its nutritional values. The small delicate fruit is widely known for its low calorie content. The serving of a cup of raspberry contains as less as 50 calories. It is a fat-free food and hence, the same serving will come with absolutely ZERO fat. The dietary fibre content of raspberry is very high. You can get almost 8 grams of fibre from the serving of one cup. Apart from these, the berry has been found to hold very good amounts of vitamin B, vitamin C, iron, magnesium, manganese, copper and folic acid. Does Raspberry Lead To Weight Loss? Raspberry is full of an enzyme called ‘ketone’, which has been found to be the most active element behind its weight loss efficacy. Raspberry ketone present in the fruit extract can work directly on the fat deposits (especially in liver and abdomen) by making the production of adiponectin higher. Being a protein hormone with the capacity of regularizing metabolism, adiponectin can improve the metabolism in stored fatty tissues, break them down, and promote the procedure of weight loss. Raspberry is a great source of insoluble dietary fibres, which can’t be digested in our body easily. Hence, eating the fruit makes our digestive procedure slow and helps us stay full for a longer time. Thus our food intake is reduced and we can stay away from gaining extra weight. Raspberry is also packed with manganese, the mineral which gives our metabolism a boost and accelerates the process of fat burning. The Glycemic Index (GI) of raspberry is very low, which makes it a good natural ingredient for losing additional fat and managing ideal body weight. According to scientists, foods with low GI are crucial for avoiding spikes in our blood sugar levels. Therefore, eating raspberry aids in stabilizing our blood sugar levels so that we can follow our weight loss diet and be successful in our journey. 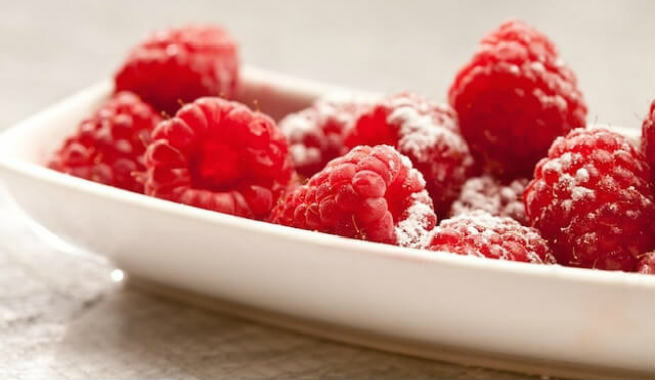 Raspberry, being low in calorie, low in fat and high in fibre, is considered as a low-energy-density food. In other words, including the berry in your diet means having ‘larger portions for fewer calories’, which is perfect for losing weight. It contains ellagic acid, which brings down the levels of low-density lipoprotein (LDL) or bad cholesterol and lowers the risk of hypertension. The acid also reduces the chance of heart attack significantly. It contains salicylic acid, which keeps cardiovascular diseases like atherosclerosis at bay. It fights against liver damages by averting the plague formation inside the artery walls within the organ which, in due course, reduces the risk of developing liver cancer. It combats type-2 diabetes by releasing adinopectin and controlling the blood sugar levels effectively. It is rich in antioxidants, which protect our body from free radical damages and help us stay away from cancer. How To Pick And Store Raspberry? Go for the berries that are bright red in color, well-shaped, firm enough and quite juicy. Avoid the ones that are green or raw and have skin with bruises or mold. The berries should be free of green hulls, or else those will be tart. As said before, raspberries are extremely delicate and go bad very fast. So, they should be consumed fresh (just within a few days preferably) instead of storing in refrigerator. However, if you need to store it anyway, use a single-layer container to keep the freshness intact. You’ve already learned about why raspberry is an excellent choice for weight loss. But the fruit can cause allergies and hence, should not be taken without consulting an expert.